Cultivated for 6,000 years, almonds possess health-promoting properties that may help support cardiovascular and immune system health (1). It is estimated that the average American consumes about one pound of almonds per year, with annual U.S. almond production approaching one billion pounds (2). The U.S. is the largest producer of almonds, accounting for 82% of the world’s output (3). Almonds possess these health-promoting properties due to the high levels of plant antioxidants called phenols and flavonoids (4). 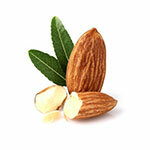 Now a new study (5) has suggested that almonds, specifically the skin of almonds, may support immune system function. In the study, researchers subjected 1.5 grams of either blanched or natural almond skins to simulated stomach and intestinal digestion, intestinal digestion, or both with a method used in previous research (6) that included sodium hydroxide, enzymes, bile salts, and calcium chloride. The control group of blanched and natural almond skins were exposed to salt water solutions with no enzymes. The researchers then exposed the different groups of almond skins (60 micrograms/milliliter in each group) to human white blood cells for 24 hours. The researchers exposed a segment of each group to a virus (herpes simplex virus, [HSV-2]) for another 24 hours to measure cell protection against viral infection. The researchers found that only the natural almond skins exhibited anti-viral protection. Specifically, levels of immune markers, such as Interferon –alpha (IFN-alpha), Interleukin -12 (IL-12), IFN-gamma, and Tissue Necrosis Factor-alpha (TNF-alpha) all significantly increased when exposed to digested natural almond skins. In addition, markers of an antibody response (T-Helper-2 [TH-2] cytokines), i.e., IL-10, and IL-4 also were also found. These markers are all representative of the body’s healthy response to viral exposure. 6. Mandalari G, Faulks RM, Rich GT, Lo Turco V, Picout DR, Lo Curto RB, et al. Release of protein, lipid and vitamin E from almond seeds during digestion. J Agric Food Chem 2008;56:3409–16. 7. Mandalari G, Tomaino A, Rich GT, Lo Curto RB, Bisignano C, Saija A, et al. Polyphenolandnutrientreleasefromskinofalmondsduringsimulatedhuman digestion. Food Chem 2010;122:1083–8.